If you want to meet Mickey and Minnie in Disney’s Animal Kingdom the place to go is the Adventurers Outpost on the edge of Discovery Island. It is filled with photographs and items they’ve collected on their journeys around the globe. 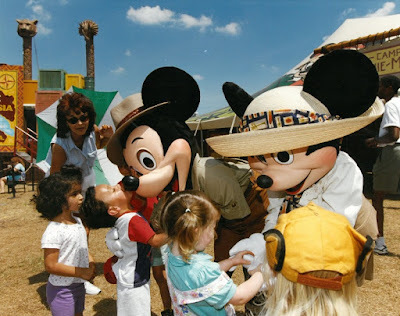 Once upon a time, however, the pair of safari ambassadors took another Adventure Outpost on the road to promote and engage potential guests around the activities of Walt Disney World’s fourth gate. Typically, you would think that this type of mobile marketing campaign would take place prior to a park opening, but the Adventure Outpost wasn’t your typical marketing push. The Adventure Outpost actually took to the road in the eastern part of the country during spring and summer of 1999. It started in Miami on April 17th of that year before moving on to Dallas, Houston, Washington, D.C., Philadelphia, New York, Chicago, Boston, Hartford, Cleveland, and Detroit before closing out its tour in Atlanta in mid-July. Known as an “urban safari camp” each stop would last two days with six hours of operation dedicated to each day, but there was no admission cost for anyone wanting to attend. What, exactly, did the Adventure Outpost have to offer? I’m glad you asked! For starters there were no animals that actually took part in the mobile safari. Instead, visitors were greeted with a 20 minute show featuring elements from Festival of the Lion King on a caravan stage. From then on, there were three sections of the Adventure Outpost to partake in. One featured a dinosaur themed play area, including sand-covered fossils just waiting to be uncovered by pint-sized paleontologists. An interactive storytelling set-up featured previews of Disney’s Animal Kingdom’s attractions and gave guests their own place in the story. Last, but certainly not least, was an area where Minnie and Mickey were available to photographs and autographs. This would have been one of the earliest examples of Disney’s move to prove that it’s animal and nature centered park was, as they would say years later, Nahtazu. With no animals in the urban safari camp, the creatures, great and small, that could be studied at Disney’s Animal Kingdom were depicted in totem poles, balloons, the interactive tour elements, carvings, and cast stories. If this sounds similar to how animal-life is integrated into many of the park’s architectural and artistic features, that’s probably not a coincidence. According to Bob Lamb, the first vice president of Disney’s Animal Kingdom, stated that the Adventure Outpost tour wasn’t about name recognition, but more about showcasing everything that the park had to offer and letting potential guests see what was happening beyond the turnstiles. Touring through miniature, in scope and size, versions of Africa, Asia, Safari Village, Camp Minnie-Mickey, and DinoLand U.S.A. seems like a great way to get guests excited about a potential visit, but nothing compares to the nature-driven park itself.